William Joseph Walsh was born in 1883 at Sydney, son of William Walsh and Annie. In 1918 he married Kathleen Agnes Buckley at St Brendans Church Annandale. There were a daughter of the marriage. He died at Camperdown on 29 July 1954, aged 71 years. Kathleen Walsh died 5 January 1975, aged 82 years. Described in the electoral roll as a person of ‘independent means’, Walsh worked as a bookmaker, with bag and clerk, standing on a regular pitch and issuing numbered tickets for the horses backed. He did well enough to buy a house at 44 Toxteth Road, Glebe. 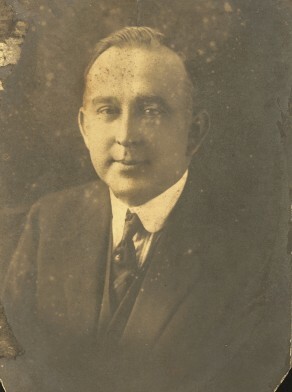 Walsh was first endorsed as a Labour candidate at the December 1922 municipal elections at which he was unsuccessful. Elected three years later, Walsh was a great hater able to weld together a personal machine. He dispensed with the tradition of rotating the mayoralty, and was supported by a Catholic fraternity of councllors who exploited social networks centred on St James parish. Walsh Avenue was named after him by the City Council in 1952. Walsh’s time as mayor of Glebe Council from December 1925 to 1929 was tainted with accusations about job patronage, irregular letting of contracts and manipulation of tenders, and portrayed in the Council administrators report in 1940 as the period of greatest abuse. A fellow council referred to him as a ‘crook’ who served a ‘barren term of office’.